Dad's birthday was on Dec 20. Since I'm still unemployed, gifts this year were primarily handmade. I took a $6 box from Hobby Lobby and transformed it with some paint, sandpaper, wax and fabric into something special for Dad. 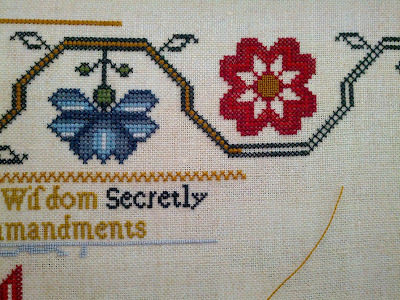 From the first time I saw this Shakespeare's Peddler chart, I knew I wanted to stitch it for him. 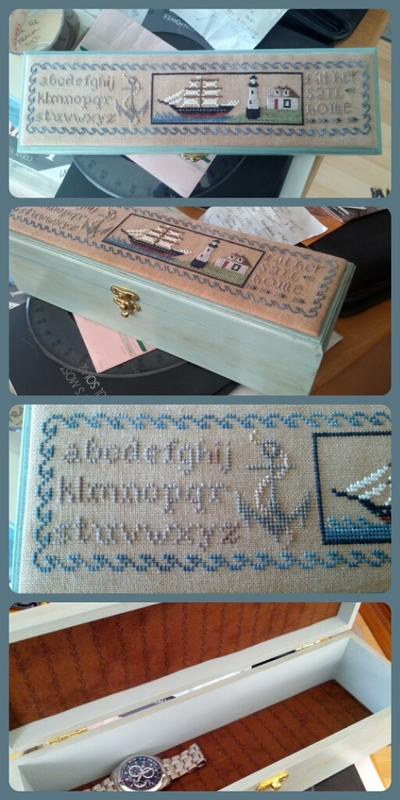 I couldn't afford the gorgeous pencil box it was designed for, so I adapted the chart to fit on top of this larger box. I thought it was perfect for his Navy heritage. Another case of me adding alphabets to charts. That mess in the background of the photo is Dad's desk, and I was happy to see he's already using the box. I lined it with some padding and fabric. He's always throwing his watches face down, and scratching up the crystal. The watch you're seeing is a very fancy Citizen watch they picked up on the last cruise and was his Christmas present. We really don't want it getting scratched up. 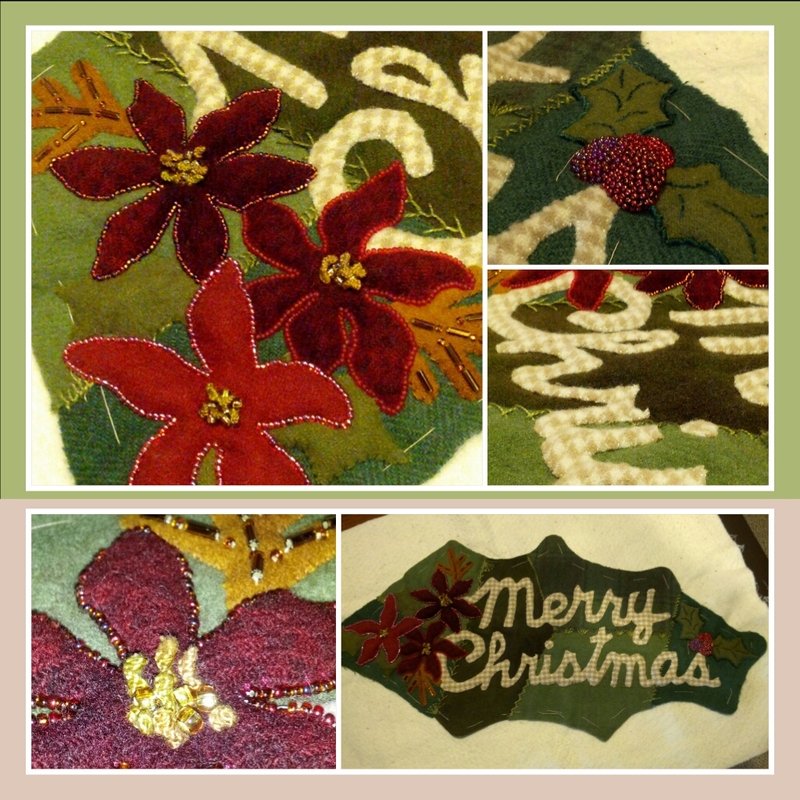 Mom's Christmas present was an embellished wool applique piece, which isn't quite finished. I still need to trim it and blanket stitch the backing on. It was hard to find time to work on it without her seeing what I was doing. My embellishments lean heavily toward beads, since I have so many of them, and they're easy. I did do some bullion stitches (around the holly leaves on the right) and some challenged myself with learning drizzle stitches (the centers of the poinsettias). Drizzle stitches are fun and easy, I'll be doing more of them. Sorry about the quality of the pictures, I was using my phone and a new to me app called PicsArt. I figured some pictures and a post are better than nothing, and I really didn't feel like taking the time to use the big camera or messing around for hours on the phone trying to edit and correct the pics like I normally would. I haven't come down with the crud as bad as Mom and Dad did, but I'm still not feeling great. The final exchange I did in 2012 was a Christmas exchange with Stitched With Love Exchanges. I received the most adorable Rudolph ornament from Debbie, along with lots of other goodies. She packed everything in a decorated plastic jar. It was a great idea for protecting everything in transit, and was used to store Chex mix nibbles during the holiday season. 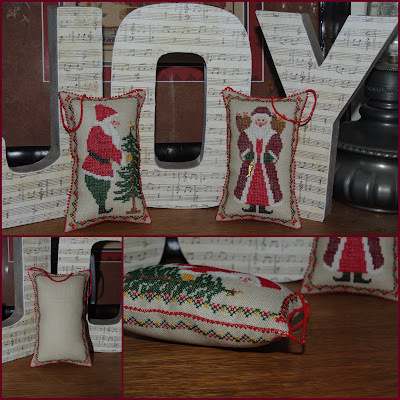 I chose to stitch 2 Santa ornaments for Melissa, finishing them with beaded edges and hangers, as well as stitching a decorative border for their backs. The Santas were freebies from Gazette 94. I'd really like to stitch them again for myself, doing the whole series, and maybe passing on the beaded edging. One of the extras I sent was a chocolate advent calendar. I have some very fond memories of these from when I lived in Germany as a young child. Pretty crappy chocolate in them, but I still loved opening up the little squares each evening to get my treat. I had mentioned in my last post I needed to find the picture I took of Delaney. Just like I thought, it was on Mom's fancy new smartphone. Delaney is 15, and has had a tough life. Don't ask me what she's officially diagnosed as having, I just know she's my special cousin, suffering from both physical and mental disabilities. Its very frustrating for her trying to communicate. 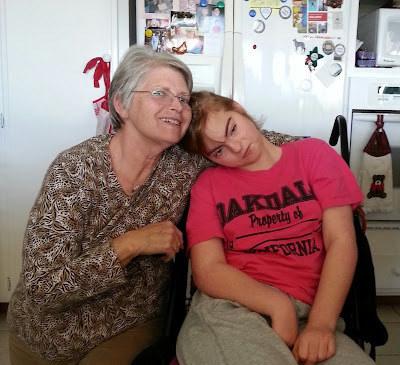 She understands more than what people give her credit for, but she can't talk. She definitely remembers Mom from the last time they were together, and greeted her with lots of hugs. It took a few hours for her to warm up to me, but I got my fair share of hugs too. While watching the Rose Parade this morning, I worked on some Ann Smith flowers. I really felt the urge to start something new last night, for New Year's, but held off, instead just moving to a new section of Miss Ann. Here's just a small snap of the top border flowers. I'm still loving her vibrant colors. I actually stitched that blue flower twice. The first time was with some duller blues (I had originally adjusted some of the colors). I decided to rip it out and go back to the brighter turquoise blue originally called for. Its definitely mellower stitched and surrounded with the other blues than in the full skein. Ann Smth is stunning Mindi. I love the box you made for your Dad, homemade gifts are the ones to be treasured. Your Mum's present looks pretty amazing too. What wonderful, special gifts you made your parents! Such work went into them. Your stitched items are just lovely. 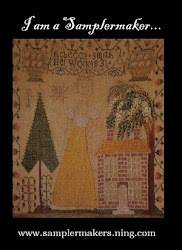 What beautiful gifts for your parents, and all the other stitching is wonderful too - well done! Your gifts are gorgeous especially the one for your Dad. Happy New Year. Beautiful and perfect gifts for your parents! Your cousin looks very comfy all snuggled with your mom! Best wishes for a Happy New Years! Your gifts are just lovely. I'd much rather have them than something from a store. Love your Ann Smith! Aren't the colors wonderful? And your gifts for your parents -- just lovely! I especially love that box for your dad. Nice exchange gifts as well. What a lovely gift to your father, hand made gifts are always the best . Wishing you a HAPPY NEW YEAR , hugs. What wonderful gifts you made. They are treasures. What a great exchange too. The Santa's that you stitched are lovely. I am trying to finish a couple of things before focusing on my Bristol Orphanage sampler. Soon! Clever and creative choices for the gifts - beautiful. I'm sure your parents love your handmade gifts, Mindi! That ship box is so special...and I love the two Santas you made. Wishing you lots of happy stitching days this year! Wonderful finishes Mindi! Love your Santa's and your Dad's box is beautiful! Congrats!